Bwletin Cymdeithas Emynau Cymru ["bulletin of the Welsh hymn society"] includes critical studies of hymns and hymn-writers, with some book reviews; it also includes society notes. It is in Welsh throughout. 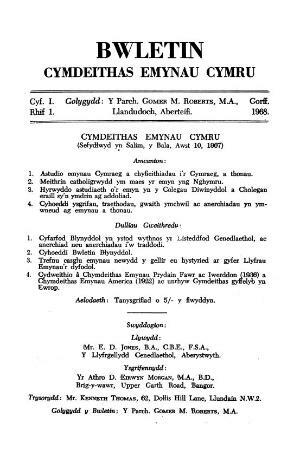 Publisher Details: Cymdeithas Emynau Cymru was founded in 1967 to promote the study and use of Welsh hymns and hymn-tunes.